Julie Fragar’s paintings are a documentation of the traces of memory, history and fractured reality. 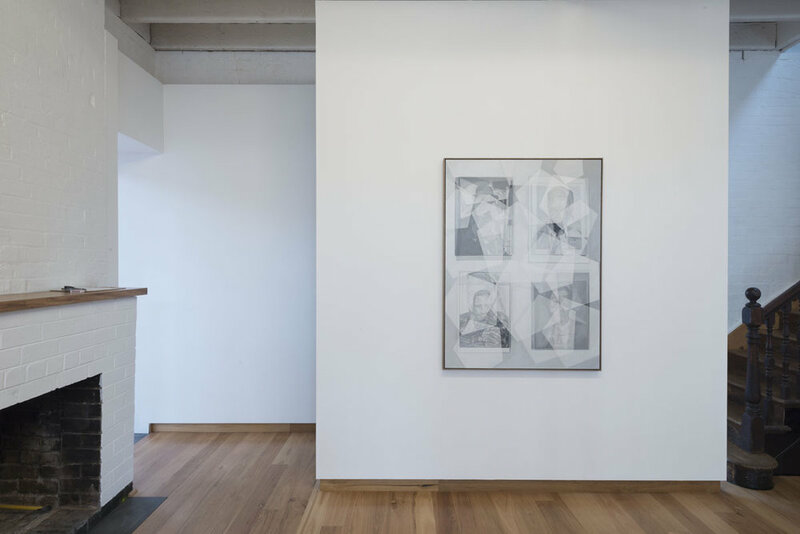 Recognising how well her previous monochrome paintings worked, the artist decided to explore this aspect in the current works in this exhibition. She presents a body of work which shimmers in a multiplicity of frosty, quiet greys. This working-method has allowed Fragar to paint into all of the images at once, not having to worry about colour-changes between individual works. The exhibition has a great continuity and cohesion, wherein image and surface have a unity throughout. This technical decision conjoins the works and allows a sense of connection between the various pieces. Slowly, various narratives unfold and become evident in the paintings. Things are hidden and, conversely, revealed as the pictures unravel in front the viewer, giving up their secrets and depths. The ‘stories’ that disentangle are deeply personal to the artist, and yet deeply mysterious to the audience. The ‘reality’ that is finally exposed is the kind that occurs to us in dreams – completely believable and yet strangely dislocated. Each image exists as a foil for another within the exhibition. Almost using the techniques of a post-structuralist novelist, Fragar presents a fractured narrative which slips between past and present simultaneously as she ‘documents’ deeply personal accounts of her family history. The effect is hypnotic and trancelike as we succumb to the overlaying of images and surfaces. It has been noted that history is a construct and that no account of an historical event is ‘believable’ because it only exists in the imagination of an individual who remembers it, or who writes it down: its accuracy is always deeply suspect and never finite. Fragar’s paintings are a confirmation of this. They ‘reveal’, and yet they obfuscate; they disclose and yet they mystify – in the same way that our minds attempt to make sense of the past, the present and the future. Central to the exhibition is the figure of Antonio de Fraga, a distant, historic relative of the artist, who lived on the Azore Islands, off the coast of Portugal. As a twelve-year-old, the boy was separated from his mother and placed secretly by his father on a whaling ship. During a seven-year voyage he was twice shipwrecked and witnessed the ship’s crew being eaten by cannibals in Fiji. He was finally rescued by missionaries who brought him to Australia. Fragar recognises perennial patterns in the story, which relate to all young men eventually breaking ties with their mother and family. In Intergenerational (Fraga/Fragar), images are depicted of every generation of the artist’s family, from Antonio right up to her own children. In the dreamlike Floresian Australian, we see images of the artist’s children. Her daughter appears in the centre whilst her son appears in silhouette, doubling for the unfortunate Antonio. Fijian women on a waterfall and Azores Whalers setting off to sea complete the picture. Fragar’s paintings lie between fact and fiction; reality and mythology. We complete them with our own stories and histories.